Kayla is a birth doula who supports birthing parents and partners before, during, and after their labor. She provides emotional support, pain management techniques, comfort measures, and evidenced-based resources throughout the whole process. Her services include prenatal visits, joining you in early labor until a few hours after the birth, and postpartum visits. Childbirth is an incredible and significant moment in your life and Kayla would be honored to join your birth space to support you! Whether you are planning a hospital birth, home birth, birthing center birth, epidural birth, un-medicated birth or cesarean birth, I'll be with you. "Kayla understood what I needed even if I couldn’t fully communicate during the intensity of labor. She made me feel comfortable and I knew I was under great care. I would recommend her in a heart beat!" "[Kayla] was supportive in every way I needed her. She helped relieve my husband when he needed a break, she took all our gear from the car to the hospital room, she brought me popciles during the at home portion of labor, braided my hair, spent hours fanning my face through every contraction, she even captured moments on camera that I would have missed as my husband was helping me during the pushing stage. " ​​Not true! In fact, the majority of births that most doulas attend are in the hospital. Doulas attend births in any location - at home, birth centers, or in hospital. ​Nope! Even if you are planning to get an epidural as soon as you can, doulas can support you through early labor and help you be informed with decisions leading up to and after getting an epidural. Doulas support any type of birth - VBAC, cesarean (c-section) birth, water birth, epidural, un-medicated birth, natural birth, etc. Doulas do not provide any medical support. Doulas will work along side your care providers to make sure that you know your options and help enhance the relationship between you and your provider. It is my pleasure to serve families in the Kitsap County & Greater Seattle Area. I will be your doula in Bremerton, Silverdale, Poulsbo, Bainbridge Island, Port Orchard, Port Townsend, Gig Harbor, Tacoma, Seattle, Issaquah & more. Here are some hospitals and birth centers that I provide doula services at Naval Hospital Bremerton, Harrison Medical Center, Salmonberry Birth Center, Jefferson Memorial Hospital, The Birthing Inn, Multicare Covington, Swedish Issaquah, and more! Also I do homebirths with midwifes present. ​I'm based in Bremerton but often travel to Seattle and the Issaquah area, so if you're comfortable with the travel time I will also come to those areas! After the amazing honor of attending my nephew's birth, I've become intrigued with labor and birth. It was a beautiful experience to be able to support my sister throughout but also see how her body knew what to do at each moment. Since then I've listened to many birth stories, watched birthing videos, read evidence-based articles and books, and recently attended a birth doula training. I'm currently working towards my DONA certification as a birth doula! 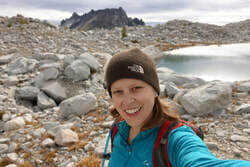 I also enjoy mountain biking, camping, hiking with my two dogs and friends, skiing, rock climbing, and just being outside!